I have to respectfully disagree. To me iron sights are like stick shift in a truck. On top of learning how to drive the damn thing you have to constantly pay annotation to the damn gear box/clutch. Same thing with iron sights. I would learn how to shoot first, then learn how to use the sights. Not sure what you are disagreeing with. How is he supposed to learn to shoot without aiming? Perhaps you are meaning to say: learn how the weapon functions first, then shoot it? I guess what I was getting at is that learning how to shoot using optic (red dot or a scope) is a lot easier at first. Once the fundamentals are established then learn the iron sights. But if all you have is the open sights, by all means use'em. Hope that makes sense. What would be good affordable (3-400$) red dot for home deffenc/SHTF urban war for the mini 14 ? Any of the aim points. Also I like the 2moa dot because it lets me be a bit more precise. astronomy equipment and I understand how they work and am comfortable being limited to what I can see without magnification. So after a little more investigation Aimpoint has a new 9000SC-NV which can accomodate night vision. This is what I intend to buy. The Mini-14 also came with a short Picatinny rail which screws into the existing scope ring slots on the rifle if you want to mount a Aimpoint Pro. I opted for a less expensive Red Dot called Vortex Strikefire. It gets good reviews. $157 It will also fit right into the 30mm rings coming from ruger. The gun is FUN to shoot (I only achieved a marksman medal in the army) so I am happy that I get all my shots onto an 8.5 X 11 sheet of paper with the iron sights at 30 yards (with my 60 yo eyes). Those are also popular, although I have no experience with them. Good luck. Last week the truck from the warehouse broke down. So the baby finally arrived today and she looks sweet. Let's see if I can put a dent in the 2000 rounds of ammo I bought her this weekend. Why is that legal in New York? I thought New York was smarter than that. You scare me with your big scary gun, they should take it away from you. What are planning to do with your 2000 bullets? Overthrow the government? Kill a bunch of schoolkids? That's a kid killing gun. It's legal in NY because the only thing stupider than the politicians in the voting public (sheeple). I have a vortex viper PST on my remington and love that scope. Jerry Miculek uses those too. 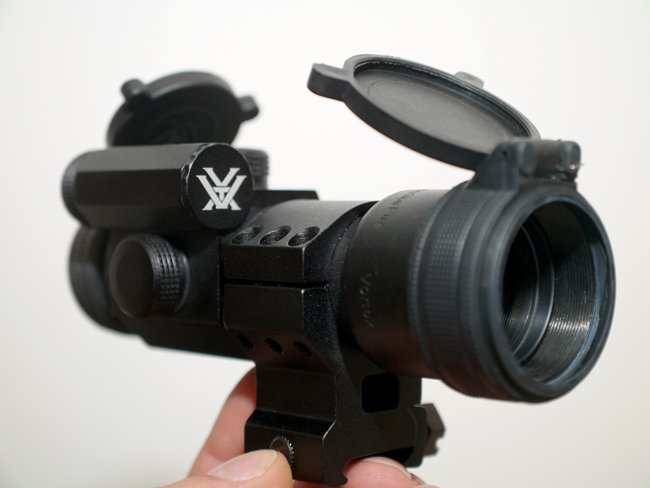 Also Vortex has a great warranty, no nonsense lifetime guaranty to fix or replace the optic. I'm looking forward to the review! Give it time. Some democrat in your legislature will see a picture of one of those rifles and say "That's still legal? We need to fix that." And they'll be driven by people who really do think the things I put in my sarcastic post. We just picked up a mini14 as well. Thanks for the info on scopes. We can't seem to locate any magazines - anyone have a preferred online stores? We can't seem to locate any clips - anyone have a preferred online stores? In NY we are limited to 10 round clips. Do you have any limitations? I bought some Pro-Mag clips which are just as good as Ruger original equipment. 10 rounders are actually very pricey due to NY's assinine legislation. I like the EOTech. A one moa dot for precision and a 65 moa circle for up close and personal! Not to be technical, but they are called Magazines. Ruger has 20 ronuders $39.95 and 30 rounders $49.95. While everyone was at the pool or the water park (it's really hot) I went to the range and dialed in my Vortex strikefire. I like my mini14. Yesterday I was at the range shooting the 16 inch Rossi .357 I like it too.